Frets on Fire Game Review - Download and Play Free Version! Play the guitar with your keyboard and set the fretboard on fire! Ready to make your rock star dreams come true? But you say you don't even have a band or even any musical talent? On top of that, all you have is a computer and a keyboard? Well then, fret not! Because Frets on Fire just might be the perfect freeware game for you. 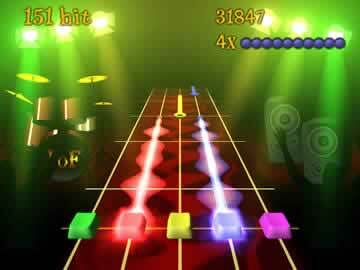 In the vein of Guitar Hero, Frets on Fire will challenge your musical skill and help you develop some fast fingers as you rock along to some kickin' tunes. Played entirely with a keyboard, you'll be on fire in no time, with the ability to add more songs down the road from the entire Guitar Hero catalog, or from the growing list of songs (hundreds) made especially for Frets on Fire. Download this cool freeware game today and unleash the fret master in you! Let’s Rock on the Computer! 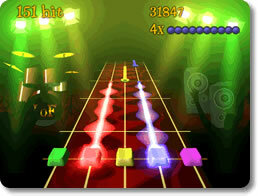 Throughout the latter half of the 2000s, the rhythm genre was dominated by Guitar Hero. Sadly, most titles in the series were only available for the consoles; PC, Mac and Linux gamers were generally left in the dust. Fortunately, the ingenuity of a team of skilled independent developers soon came to the rescue. They created Frets on Fire, a freeware rhythm game that borrows quite heavily from Guitar Hero and adds a few of its own little innovations to the mix as well. It may not have the production values or include its own guitar-shaped controller, but it still finds some creative ways to simulate the rock star experience using an ordinary keyboard. That’s assuming you’re also willing to overlook many of its glaring issues. In terms of appearance, Frets on Fire borrows so heavily from Guitar Hero, it’s a wonder Activision never sued the makers. The action primarily unfolds over what appears to be a five-string guitar tail, with notes sliding down toward you. It may seem shamefully derivative, but there’s probably a good reason for that. For one thing, it’s attractive in spite of the game’s independent origins. For another, it just works amazingly well. A simple glance at your screen is all that’s needed to see what notes you’ll have to play and how long you’ll need to pick them. More than that, it makes it a whole lot easier to align your notes with your keyboard controls. The more important thing for a game like this is the audio quality. Frets on Fire does a decent job at providing some sharp sound, but if you really want to get the best out of this game, you’ll need a nice sound card, some awesome speakers, or a solid set of headphones. Don’t sweat it if you don’t have any of those; Frets on Fire is perfectly playable with basic equipment. Concerning the quality of the music, it fits the rock star style that the game is aiming for down to a tee, but whether or not you like it is going to come down to personal taste. The more serious issue is that the selection of songs in the initial download is severely limited. There are only four to start with and although they each have four levels of difficulty, it won’t take long before you get bored of them. There is a way around this flaw that will be covered later, but a more expansive library on the outset would have given Frets on Fire a more attractive first impression. One thing that especially doesn’t fly too well is the voice-acting. Jurgen, who acts as the mascot for Frets on Fire and serves as your guide in the tutorial, speaks with an exaggerated fake accent that can be very grating on the ears. It doesn’t help that he’s written to have an obnoxious personality where he has to constantly rub his superior skills in your face every step of the way. It might have been to give the game a slick, in-your-face attitude, but it grows tiresome very quickly. You won’t need to hear Jurgen too often, but no jury would convict you for wanting to smash his smug face in with a real guitar when you do. Enough with the Looking, Let’s Get to Picking! Frets on Fire looks like Guitar Hero and it pretty much plays like it too. The basic idea is to play the correct combination of notes displayed on your screen at the right time. Hitting the right notes successively nets you a higher multiplier, which increases your score tenfold. However, if you get so much as one miss in your streak, the multiplier resets. Getting a perfect score requires a steady picking finger and completely undivided attention. Overall, it’s pretty typical rhythm gameplay. Where it differs from the rank and file is how the controls work. Hitting a note is not simply a one button process. First you have to tune the note by holding down the corresponding key, then you have to pick it once the time is right. It’s strange; a game devoted to a keyboard instrument would probably have made a lot more sense, but it works! The game even encourages you to hold your keyboard up as if it was a guitar itself. You don’t have to do that if you don’t want to, but Frets on Fire is oddly more enjoyable that way, even if it gets you some strange looks from anyone who catches you in the act. The bad side to that is that if you play on a laptop, you’re probably not going to have as fun a time as you could on a regular desktop machine. The good news is that you don’t have to just play Frets on Fire with the keyboard if you can’t or don’t want to. The game supports both joystick and gamepad controls alike. However, the most impressive thing is that it even gives you a chance to dust off the old USB Guitar Hero controller for the Xbox 360 or PlayStation 3. Now is as good a time as any to re-experience the series on a new platform. Perhaps one of the coolest features to find in Frets on Fire is the song editor. This handy little tool allows you to take any song you like and create a note chart to go with it. It’s incredibly easy to use and controls much like normal gameplay; one could say that the process of chart-writing is something of a game itself. You can run through the song manually, inserting the notes you like as you please, or play the music automatically while you plug the notes in on the fly. You can edit the chart for any existing song you have in your Frets on Fire database or import a whole new tune to start from scratch. Your work’s not done after your notes are all set. It then becomes your job to set the finishing touches to your new song chart by labeling its title and artist, setting the A/V delay, and punching in the beats per minute. You can also create multiple levels of difficulty to add more reasons for users to replay the song even after they have mastered it. This leads to the community-based aspect of Frets on Fire. Being an open-source project, the game invites you and everyone else with a creative mind to share their work online. 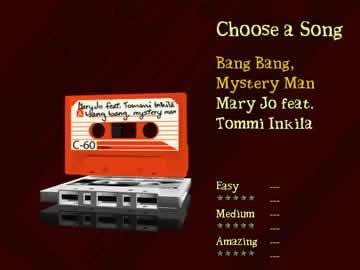 If you poke around the web, you can potentially find hundreds of song charts, backgrounds and themes to download. Aside from adding more color to the game, Frets on Fire effectively has unlimited replay value. The initial download package may be short on content, but the program’s modular nature ensures that Frets on Fire doesn’t have to be for long. Although the song editor should be easy to grasp, it still has its fair share of annoyances. The most obvious is the roundabout way you have to go about importing songs. Frets on Fire will not accept common music files like MP3s; it will only take the more obscure OGG format. This is perhaps understandable, as the makers likely don’t want to encourage excessive illegal file sharing, but it doesn’t make the creative process any less annoying. Other than that, the editor is plagued by a few issues with its interface. It’s great for adding notes on the fly, but fine-tuning their positions can be a pain. Worse, there’s no real way to jump to specific areas of the song; you either have to play your way there or scroll all the way to the exact second you would like to edit. It’s terribly inconvenient and outdated in this day and age, especially when compared to serious audio-editing applications. The most unfortunate thing about Frets on Fire is that its community isn’t quite all it should be. It might have been impressive back in the day, but it feels awfully small and fragmented at this time. Many fan sites have disappeared over the years, dead links are irritatingly common, and a lot of projects have since been left incomplete. You can certainly find extra songs, themes and whatnot if you hunt around, but without any good central places to start out with, expanding your game is going to be more difficult than it has any right to be. Capping off the problems with Frets on Fire are the myriad of technical bugs that plague it. It’s not the most well-optimized application out there; the load times are frequent and lengthy, the pauses between menus are long, and the game can even be subject to freeze-ups and crashes, especially on lower-end systems. None of these things singularly ruin the experience, but they do bog things down. Thankfully, things tend to run smoothly while you’re actually playing the game, so you won’t need to worry too much about getting a low score due to some hiccup in the frame rate. It’s just that in-between, Frets on Fire’s limitations will really try your patience. When you think about it, Frets on Fire is kind of sad. It’s a terrific program that brings the experience of the Guitar Hero franchise to the computer in an unexpected way. It’s very fun and addictive once you start ripping. It’s very cool to create your own levels with the song editor. Finally, the amount of content you can find online makes it something you can easily come back to again and again. Unfortunately, it’s marred by a ton of annoyances that make it a little frustrating to use, and a degraded community that makes adding more content a real chore. Make no mistake; Frets on Fire definitely deserves some consideration, especially since it’s free. It’s just that you can tell it could be so much better than it currently is. Check out how you can jam to your favorite songs as the lead guitarist in Frets on Fire.